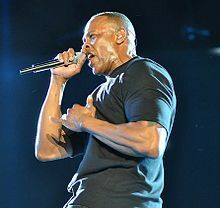 Dr. Dre in Coachella Valley Music and Arts Festival anni 2012 agit. 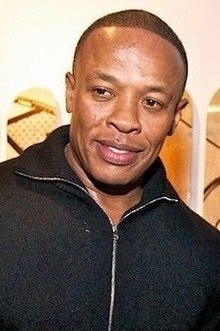 Andreas Romelle Young (natus Andre Romelle Young Compton Californiae 18 Februarii 1965), vel Dr. Dre nomine scaenico notus, est rappista, phonodiscorum productor, et negotiator Americanus, qui Aftermath Entertainment et Beats Electronics societates mercatorias condidit. Olim fuit co-possessor societatis Death Row Records et artifex in eius phonodiscis divulgatus. Alba musica produxit multorum rapianorum, inter quos sunt 2Pac, The D.O.C., Snoop Dogg, Eminem, Xzibit, Knoc-turn'al, 50 Cent, The Game, et Kendrick Lamar, quorum omnium cursibus vitae procuravit. Putatur persona magni momenti in G-funk hiphop litoris occidentalis promovendo, modo musicae rapianae cuius praecipua proprietas sonica est synthesizer sonorum et ictus tardi et graves. Anno 2014, secundus a divitissimo homine in scaena hiphop Americano a Forbes aestimatus est, $550 millionibus valens. Indicem Forbes anni 2015 superavit, $620 milliones aestimatas anno 2014 merens, vectigalibus inclusis. ↑ "The Forbes Five: Hip-Hop's Wealthiest Artists 2014". Forbes Magazine. 5 Maii 2014 . Greenburg, Zack O'Malley. 2015. World’s 30 Highest Paid Musicians: 1. Dr. Dre: $620 million. Forbes Magazine, 26 Martii. Kenyatta, Kelly. 2001. You Forgot About Dre! : The Unauthorized Biography of Dr. Dre and Eminem: from NWA to Slim Shady: A Tale of Gangsta Rap, Violence, and Hit Records. Los Angeles: Busta Books. ISBN 9780970222497. OCLC 45162196. Ro, Ronin. 2007. Dr. Dre The Biography. Novi Eboraci: Thunder's Mouth Press. ISBN 9780970222497. OCLC 671560558. Vicimedia Communia plura habent quae ad Dr. Dre spectant. Novissima mutatio die 5 Februarii 2017 hora 20:07 facta.